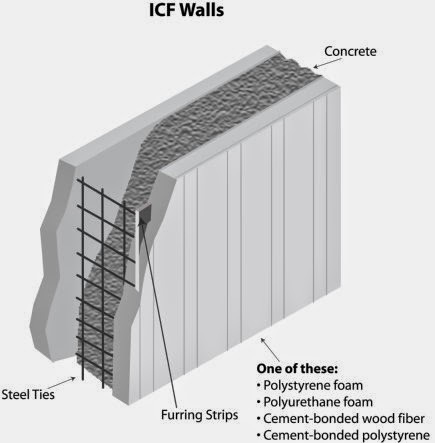 Should you or anyone you know buy an Insulated Concrete Form (ICF) home? As far as I’m concerned living on my own land, owning my own self sufficient house, going solar, and feeling like I’m giving back is all I really want out of life. The ICF house is a dream of mine, and it might not be that far off – so long as it IS very far off the grid! When making an ICF house, they first stack the Styrofoam and create the walls, and then the concrete is poured into the hollow center of the wall, essentially creating a concrete sandwich of sorts, with insulation on both sides. This created structure is the essentially the “matrix” of the house, which is then designed to the buyer’s specifications or it's built according to the builder’s previously agreed upon choice of style. Whichever the case, the result is one heck of a sturdy house that looks like any other well designed home. These homes are sound are absolutely incredible to me. What you basically end up with is a house that is nearly sound proof, more are less impervious to weather (including tornadoes and hurricanes, hail, and fire) . They are far more efficient to heat and cool, and give you added security, to keeping decent air quality control from their tightly sealed form. It's one type of house that you can honestly feel safe and secure in, especially if you worry about your children or spouse, as almost nothing’s going to knock this sucker down, and its construction is second to none! You might even get lower insurance, a higher tax break, as well as a terrific resale value, but why would you ever move – I mean ever? Call 417-204-4949 and find out all the incredible details of owning an ICF home today!